Sub-Saharan Africa remains the weakest-performing region in the world, as it has been since 2007. Nonetheless overall Sub-Saharan African prosperity grew considerably this year. Sub-Saharan Africa performs most strongly relative to the rest of the world in the Natural Environment pillar. In particular, Sub-Saharan Africa is impacted less by Environmental Pressures than other regions of the world, comprising 10 of the 20 best performing countries in that sub-pillar. The region is a long way behind others in both Education and Health. In Education, it is the weakest performing region in 10 out of 12 indicators. In Health, it is last in six out of 12 indicators. Safety and Security is the pillar that has declined the most in the last year. This is led by Niger, South Africa and Congo, but 31 others have also seen a decline, due in part to increased battlefield deaths. For example, in Niger, there were an estimated 274 deaths caused by conflict with Islamic State. Nigeria has risen six places, driven by improvements in Business Environment, Economic Quality, Social Capital and Personal Freedom. Within Personal Freedom, the percentage of those satisfied with the freedom to choose what to do with their lives rose from 68% to 79% over the last year. This was a return to a level similar to its 2011 score. Democratic Republic of Congo rose four places, driven by improvements in Business Environment, Social Capital and Personal Freedom. In Business Environment, for example, domestic perceptions of the Democratic Republic of the Congo as a good place to start a business have increased from 64% to 74%. The number of women in parliament increased across Sub-Saharan Africa. The largest increase in 2017 was in Ethiopia. Rwanda, Senegal, South Africa and Namibia are in the global top ten for most women in parliament. Benin improved by one ranking globally through better Personal Freedom. It abolished the death penalty following a ruling by the Constitutional Court at the beginning of 2016. 14 Sub-Saharan African countries are in the world’s top 20 for labour force as a share of the population, with Madagascar topping the global rankings. Sub-Saharan Africa has improved considerably in 2017 in two essential elements of Prosperity: Business Environment and Governance. For Business Environment, this represents the continuation of a promising trend towards creating a more entrepreneurial climate. Scores have improved by 22% since 2007, with all but one nation (Sudan) in the region witnessing improvement. This year saw 31 out of 40 Sub-Saharan countries improve their Business Environment score. 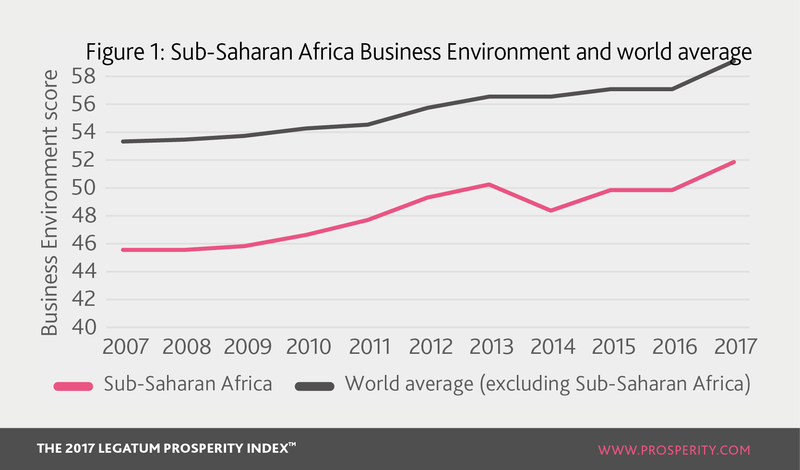 While Business Environment has improved across most indicators, the ease of starting a business has had a pivotal impact on African prosperity. This is largely the result of the priority that it has been given by many countries in the region. In 2009 Tanzania aimed to improve its performance in the World Bank’s Ease of Doing Business rankings, by joining the top 100 countries within two years. While they have not yet achieved this, there have been notable improvements in the Tanzanian Business Environment. These include the ease of resolving insolvency and of getting credit, prompted by Tanzania expanding its credit bureau borrower coverage. Rwanda, which tops the Sub-Saharan Africa Business Environment Pillar, is also guided by the World Bank Ease of Doing Business framework. Among this year’s major reforms were improving online registration and streamlining post-registration procedures, as well as easing the resolution of redundancy. In the past, Rwanda has also shortened registration procedures and reduced registration fees. Though encouraging, Sub-Saharan Africa’s Business Environment remains poor compared to the global average, still ranking sixth out of seven regions. This reflects many of the region’s wider challenges, including the lack of essential business infrastructure and investor protections. For example, Sub-Saharan Africa ranks bottom in three core indicators of business infrastructure: broadband subscriptions, cost of obtaining an electricity connection and the World Bank’s Logistics Performance Index. While the region is improving its Business Environment, it is being consistently out-performed by others (see Figure 1); while every country except one in Sub-Saharan Africa has improved their Business Environment rankings since 2007, so did 81 other countries around the world. Although positive for global prosperity, it also highlights the dangers of not continuing to push forward with reform in Sub-Saharan Africa. 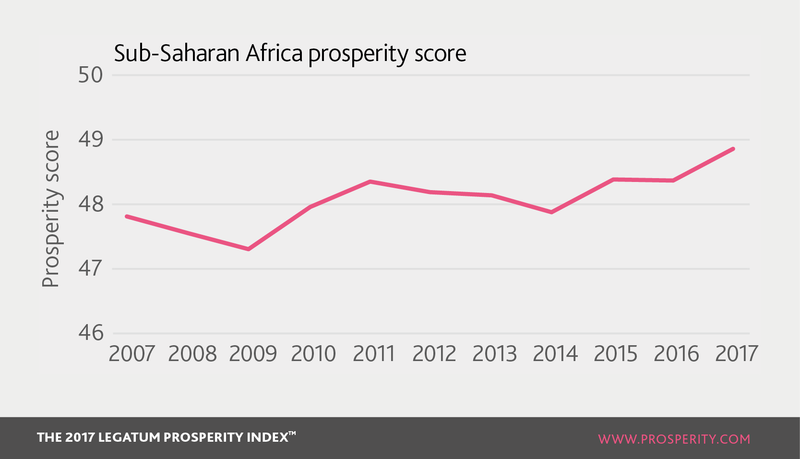 Improvements in Governance in Sub-Saharan Africa have also helped to secure the region’s progress towards greater prosperity. Adherence to the rule of law and effective and accountable governments are increasing steadily across the region. There are some notable examples of good performance: Mauritius is ranked 26th in the world for Governance, above South Korea and Israel. Most recently, improvements in Governance have been driven by gains from Tanzania, Zambia and Uganda (among others), mainly due to increased confidence in judicial independence and in elections. 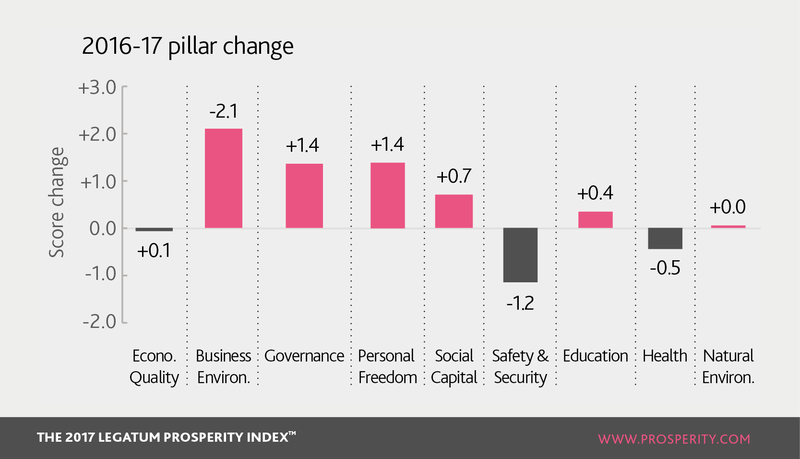 Yet despite this improvement, Sub-Saharan Africa performs poorly in Governance. For example, it is the worst out of all regions on regulatory quality. Businesses cannot prosper without a government that obeys the rule of law and implements regulations which foster innovation. There is much work to be done to improve Prosperity in Sub-Saharan Africa. While the challenges should not be underestimated, the region has improved significantly since 2007 and holds enormous potential for the future. As the Business Environment Pillar shows, Sub-Saharan African countries have taken up reform willingly and entrepreneurship is flourishing. Nevertheless, future economic and social wellbeing is dependent on addressing persistent insecurity and investing in human capital and the quality of institutions. Until this is achieved, the pathways towards greater prosperity will remain limited for many Sub-Saharan African nations and their peoples.